If you want something light and refreshing, cucumber flavored water is a good choice. Slice some cucumbers, throw them in a pitcher of water, and let the water become infused with the cucumber flavor. Another light and refreshing twist? Cucumber lemonade. Now I will tell you that it was from the Papa Dale's Diner truck that I first had it. Keith was serving it last September at Truckin on the River. Meanwhile, I have a Eureka lemon tree with hundreds of lemons on it. My tree is about 25 feet tall, so it's an old one and it is quite fruitful. For this version I didn't infuse the water. Instead I pulled out my juicer and juiced half a cucumber. If you don't want the green tinge, then be sure to peel your cucumber first. If you want to infuse the water, then start the day before by thinly slicing a whole cucumber and let it sit in the 4 cups of water in the refrigerator overnight. Make a simple syrup: Combine the cup of sugar and cup of water in a small saucepan and heat over medium heat until the sugar is well dissolved. Remove from heat and allow to cool. 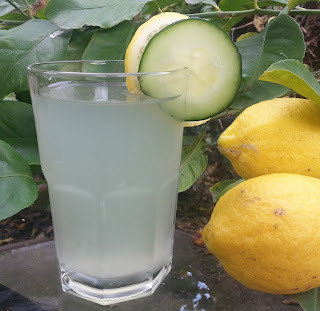 In a large pitcher, mix together the lemon and cucumber juices with the simple syrup. Add the 4 cups of cold water. Mix well and refrigerate for an hour. Serve cold over extra slices of lemon and cucumber.